It's taken me a while to get around to it, but I finally did. 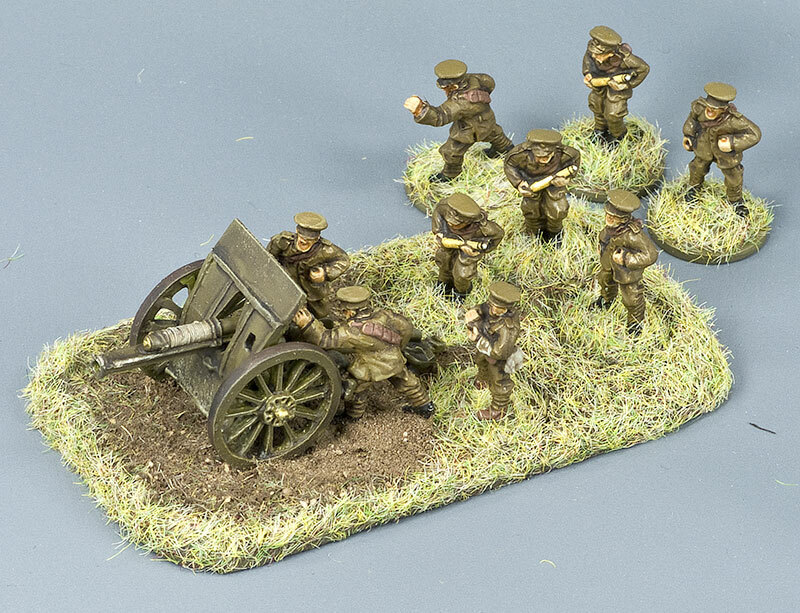 This is the British WW1-era QRF 18pdr, with crew uniformed for the first half of the war before steel helmets were issued. 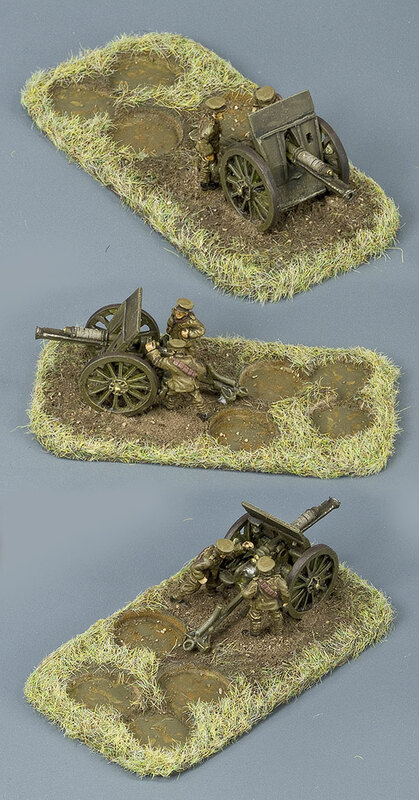 I've based the gun with only two crew members permanently attached, as it's intended primarily for use with the Bolt Action rules, and I want to be able to remove casualties. I'd have made the last two removable as well, but then I wouldn't have been able to get them close enough to the gun — not easily, at any rate. I have some spare crewmen (standing behind the gun base in the image above) which will probably end up being used for... something, I don't quite know what as yet. I really like the figures from Peter Pig. I like them a lot. 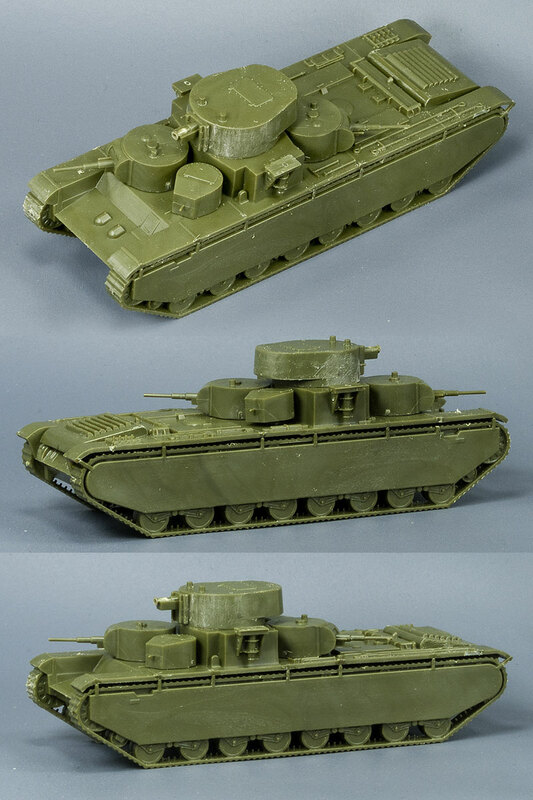 After a bit of a delay, I just received an order from Plastic Soldier Company of a squadron-lot of Zvezda 1:100 scale T-35 heavy tanks. The delay was due to PSC not getting their shipment from Zvezda on time — I hear that Zvezda's CEO just died, so it may have had something to do with that. Anyway, they did keep me informed about what was going on, so I'm not all that worried about having to wait a couple of weeks longer than expected. The squadron deal got me five tanks for £12.75, plus about two quid fifty postage. So they ended up at about three quid (about $NZ6.00) each, which is not too bad at all. Each vehicle comes on two sprues of fairly soft plastic — not as soft as, say, Airfix toy soldiers, but soft enough to cut (and mark) very easily. They're snap-together kits, and though I did use glue on this one, they snap together pretty firmly, and I doubt that they'd be likely to fall to bits under normal handling. The models assemble very quickly; I'd be surprised if this one took longer than about ten minutes, and that includes a bit of time sanding away some mould lines around the turret. 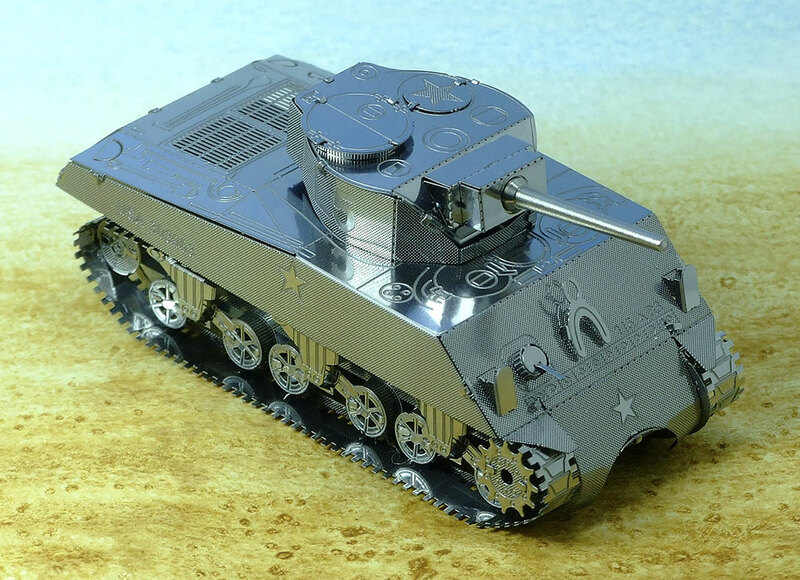 The detail has been simplified a bit, but not so much that it loses the essential form of the tank. 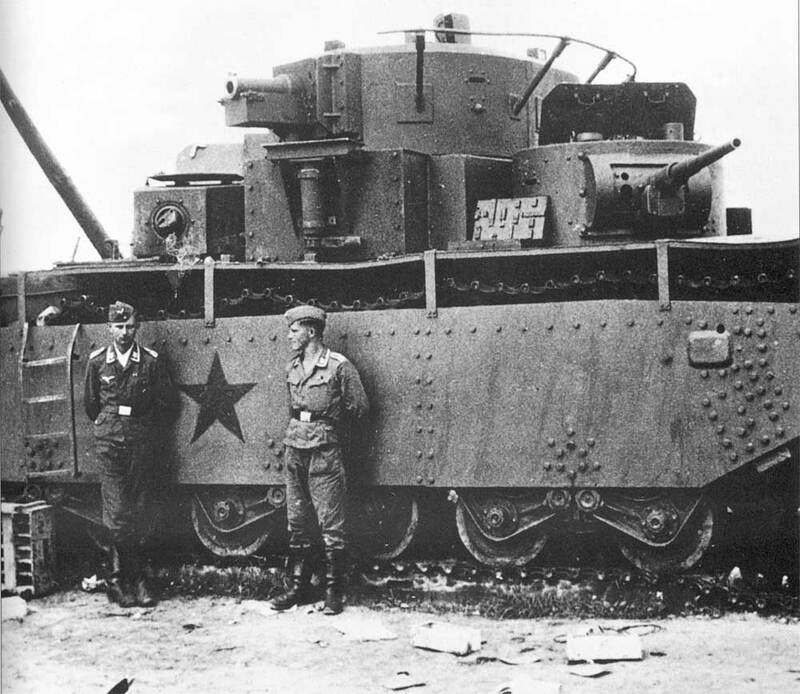 One area that could have done with being detailed a bit less in scale is in the rivets. There is rivet detail on the side-skirts, but it's so fine and delicate that it's hardly visible at all, and may not survive being painted. I would have liked to have seen something a bit more definite. All in all, I'm pretty happy with them. 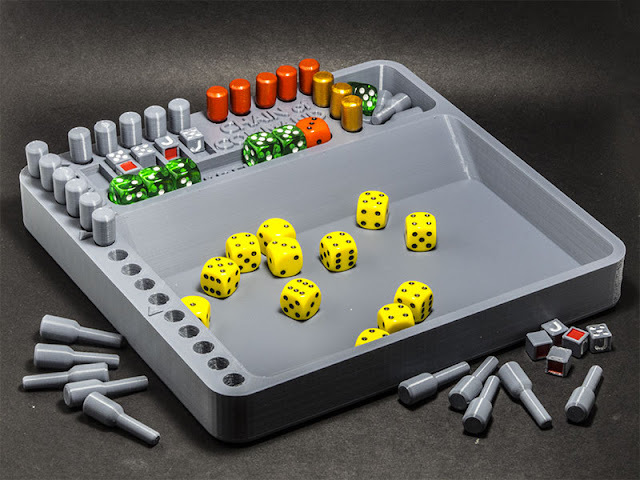 They're cheap as chips, and make excellent wargaming pieces. The best thing about them is that they cost less than a quarter what I'd have to pay for a T-35 from Battlefront. 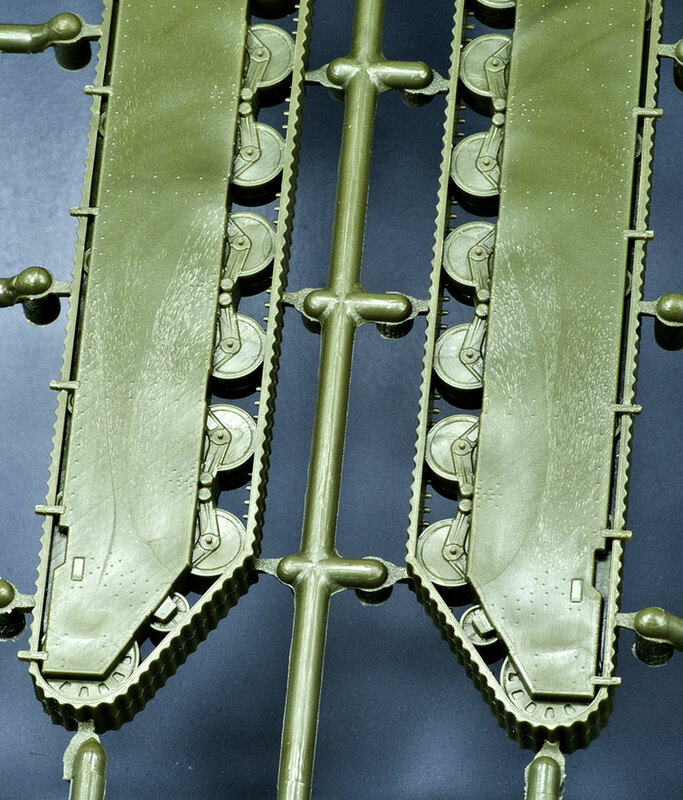 the rivets in the side-plates of Zvezda's offering are actually UNDER scale. Those rivet-heads must be easily 40-50mm in diameter. I'm tempted to try adding some rivets to the next one I do... maybe a sheet of 3d rivet waterslide transfers is in my future. Here's an example of a figure I just can't seem to get around to finishing off. I've had it for maybe thirty years, and it's been stuck in this state for at least six or seven years. 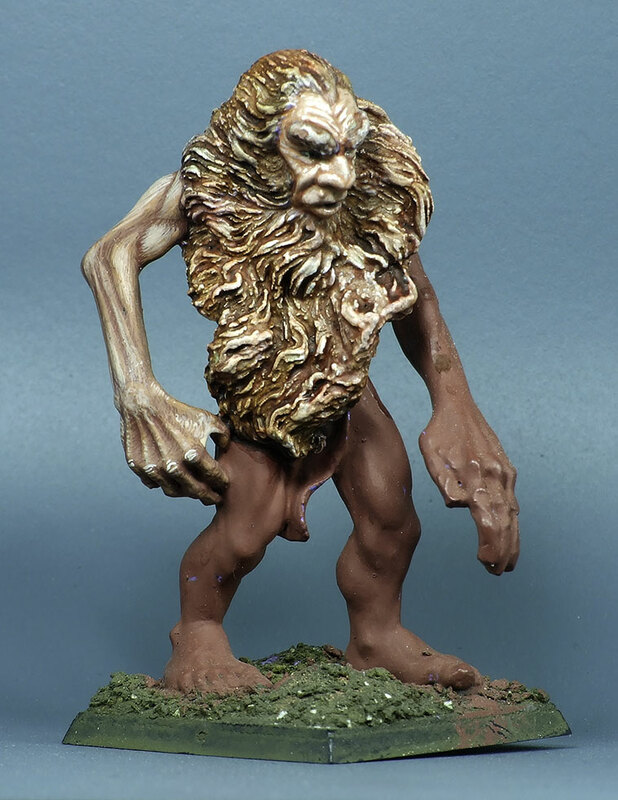 It's a storm giant, from Ral Partha I believe, or maybe Citadel, about 70mm tall, and it's a pretty old miniature — mid '80s, I think. It originally had something that was probably supposed to be a lightning bolt or fireball or something coming off its left hand, but I thought it mostly just looked like a turd, so I chopped it off and re-carved the fingers. I've made a start on its vast areas of bare skin and the improbably large beard, but I've never been very happy with it and it's stalled at this point. Maybe I'll finish it off one day, but I don't know if I can be bothered with it. Not really tin-plate, but laser-cut aluminium shim. Annette found this amongst a bunch of novelty items in a stationery shop a few weeks ago, and naturally thought of me. It comes as a couple of small flat sheets plus a turned barrel, and uses tab-and-slot construction. It's not exactly a fine scale model, but it was quite fun to bend and build. The trickiest thing about it was that reflections from the shininess of the metal often made it difficult to distinguish where anything was when trying to match up the tiny tabs with the equally tiny slots. She bought me another at the same time, a P-51 Mustang. That'll be next. 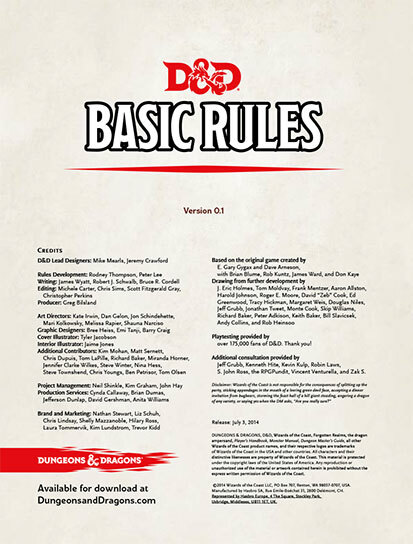 Well, I've downloaded and read briefly through the free D&D Basic Rules, and so far they've left me pretty unimpressed. They're quite incomplete at the moment. Mike Mearls said that they would be "the equivalent of the D&D Rules Cyclopaedia", and maybe one day they will be, but right now they're not even close. They include no monsters at all, and they do include a huge amount of pointless fluff and padding — at the moment it comes in at just over 100 pages, and it could very easily have been edited down to less than half that. That's not what's left me unexcited though. From what I've seen of them so far, they're pretty much just Pathfinder-Lite. They're a definite improvement on 4th Edition, but that was a pretty low bar. They're not a terrible set of roleplaying rules, they're just not very interesting. Regardless of my own lack of enthusiasm for it, I really do hope that D&D 5th Edition is a huge success, because if it is it will bring more people into the hobby. I don't much care what they play as long as there are lots of them, because the spillover effects of a large and thriving market can be very useful in feeding the niche product makers who might be more likely to produce something I'll want. This is a Games Workshop figure I believe. As far as I can recall, it came with a goofy-looking "elf" that was supposed to be riding it. 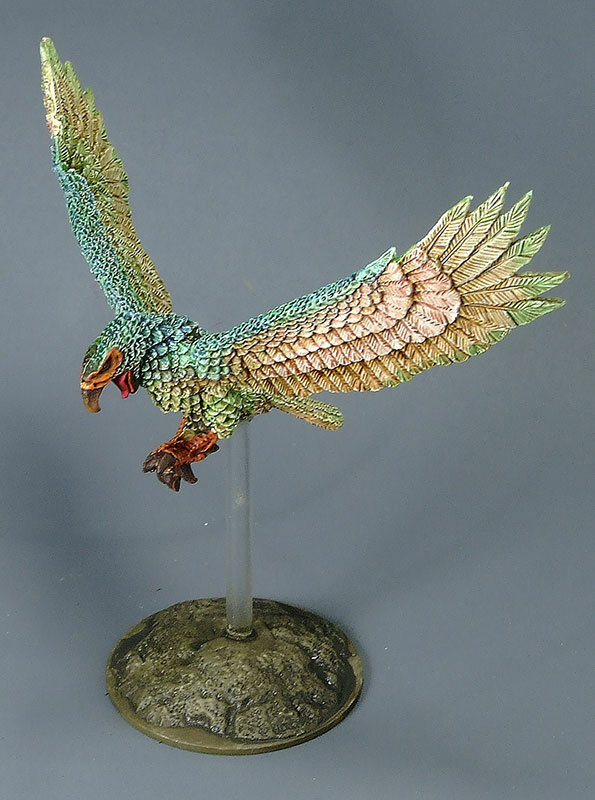 This is a semi-experimental paint job, inasmuch as I wanted, as far as possible, to paint the whole thing in various washes over a white undercoat. Apart from the beak, face and legs, that's what I did, and I think it turned out pretty well. And it was quick too — from start to finish, the whole paint job only took about half an hour. Sorting out the base and perspex flight stand took a lot longer than that. This painting technique wouldn't have worked half so well, of course, if not for the excellent incised detail on the figure. 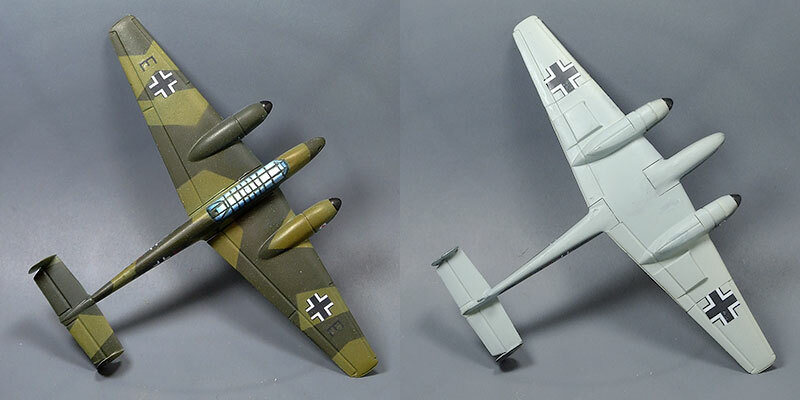 I rediscovered this old Academy 1:144 scale kit of a Messerschmidt Me110G lurking around in amongst my collection of stuff-I-bought-intending-to-do-something-with-it and thought it would make a good test-bed for trying out my newest airbrush. It's not a very highly detailed model, but its profile is identifiable on the wargames table, and that's good enough for me. 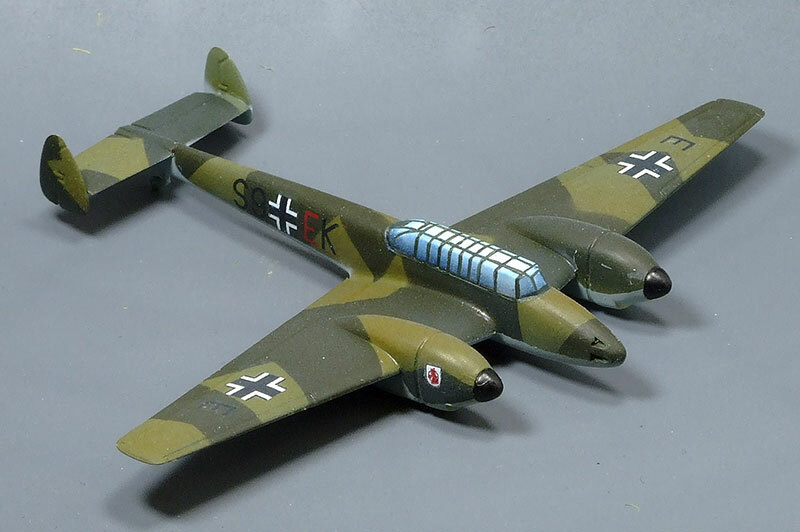 My days of super-detailing aircraft kits are long behind me. I shall have to sort out some sort of flight stand for it; I have some 3mm clear acrylic rod somewhere that should do the trick.